During peak flow at Deception Pass—a strait separating Whidbey Island and Fidalgo Island, at the north end of Puget Sound—some two million cubic feet of water surge through the 500-foot-wide opening per second. How much H2O is that? Take the average flow of all the rivers that empty into the Sound, then take that number and multiply by 50. During ebb and flood tides, the currents clock in faster than nine miles per hour, creating standing waves, sucking whirlpools, and class III conditions. And the water temperatures don’t even break 50 degrees in winter. Also, no two days ever are the same: Depending on winds, the waves can top six steep feet. It’s practically a waterfall. Which, of course, makes it perfect for a competition. 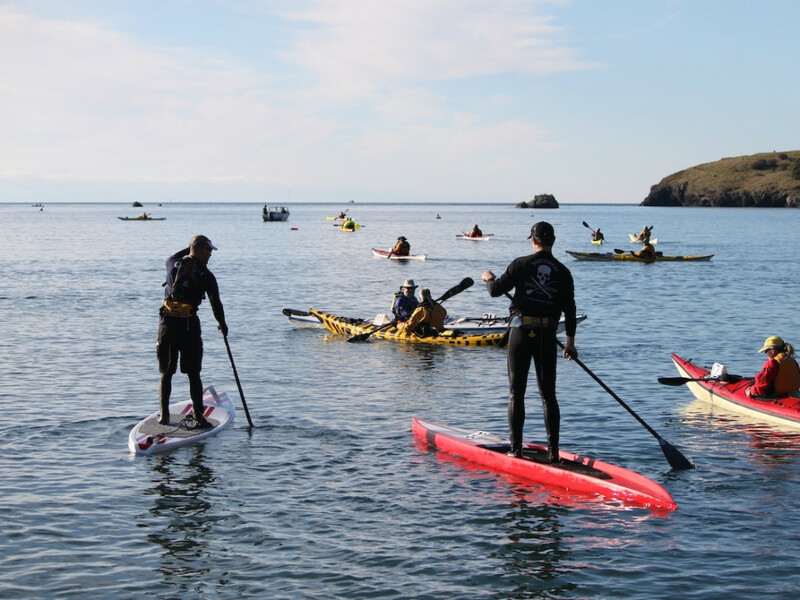 Since December 2006, expert local paddlers (and SUPers and outrigger canoeists and surf skiers) have gathered at Bowman Bay for the Deception Pass Dash, a six-mile route around Deception Island, through the Pass, around Strawberry Island, and through Canoe Pass. Why December? To help people prep, organizers have turned the event into a weekend-long celebration, with clinics and demos in Bowman Bay on Saturday, a group dinner, camping, fire pits, tiki torches—it’s dark and deep around here in winter—and post-race breakfast burgers. From the initial field of 40 boats, it’s grown to about 200. Participants should know how to roll and self-rescue, but there’s plenty of time for practice the day before the gun goes off. 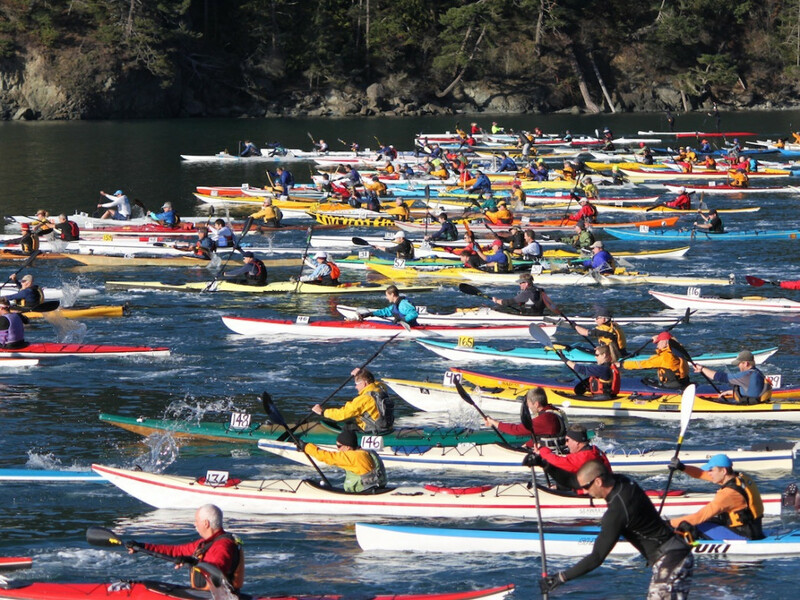 And while the Dash is over the heads of novices, the burly conditions and the lack of pretension (and big sponsorships) bring the extended paddling family together: Those who aren’t racing typically man the safety boats, and if they aren’t on the water, they man the grills and stoke the coals. 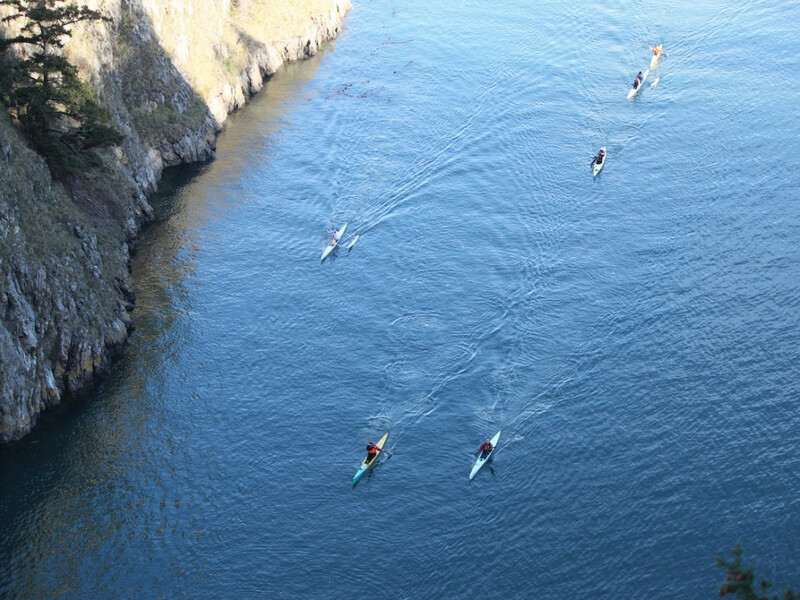 The race starts during the slack current, at 8:40 a.m. this year, just before the 9:02 ebb tide flows out of the Pass. 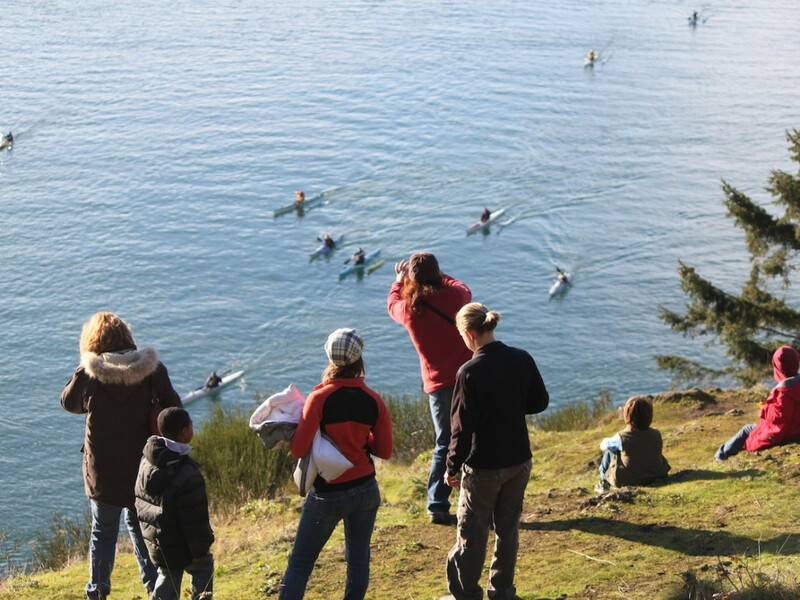 So paddlers are essentially going upstream. The catch? The ebb builds as the race goes on, so the slower you go in the first half, the harder it is, says Elizaga. Around Pass Island, boats usually hug the cliffs to stay away from the main current, and swells from the west can help push racers through, he says. Once you’re past Strawberry Island, you can coast with the ebb back home to Bowman. No matter what, the stunning scenery doesn’t hurt. After all, Deception Pass is not the most visited park in Washington State for nothing. 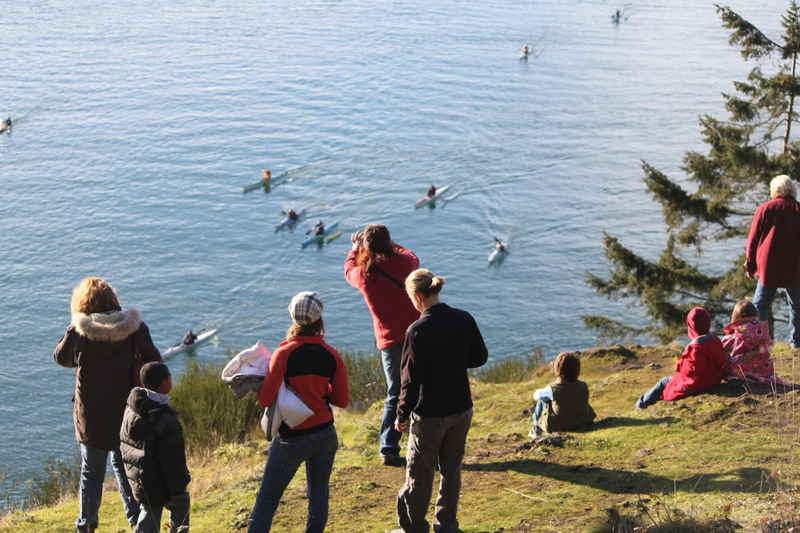 Even if you’ve never picked up a paddle in your life, it’s a good excuse to watch the action from the 186-foot-high Deception Pass Bridge, a New Deal project that went up in 1935 and remains one of the most photographed landmarks in the Northwest. (Before then, passengers had to hit a mallet against a metal lumberjack saw to call a ferry). The 4,100-acre state park, made up of ten islands, is thick with old-growth forest; thanks to 77,000 feet of saltwater shoreline, the tidepools are hopping. Trails wind under Pacific Madrone and Douglas fir, climbing up to rocky outcroppings and dropping down to empty sands. For the best view of the bridge itself, head down to North Beach. The race will be held December 13–14, 2014. For more information, visit Outdoor Adventure Center.